IS WIRE ROPE THE SAME AS CABLE? “Wire rope,” “line,” “rope” or “wire” are the only correct ways to refer to wire rope, but many tow operators refer to it as cable. Wire rope is not cable. Cable is only an acceptable term when referring to a piece of wire rope that is terminated on both ends. When that cable is connected to a power source, such as a winch, it’s no longer acceptable to call it cable. The Egyptians were among the first to twist and braid strands of plant material together to form rope. Today’s rope is made of different materials and using different methods, but the basic principle remains the same: smaller diameter material is twisted to form strands, and then those strands are twisted to form the rope (or wire, if the rope is made from steel). You might have seen the term “lay” when a manufacturer specifies the type of wire to be used on a piece of their equipment. Lay refers to the direction of the twist of the wires in a strand (right or left) and to the direction that the strands are laid in the rope (regular or lang). When you inspect a rope with regular lay, the wires appear to run straight down the length of the rope. With lang lay, the wires twist in the same direction as the strands, giving the appearance that the wires run across the rope. Regular lay rope is the most common wire sold today. 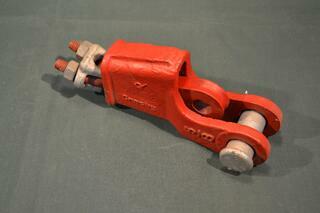 HOW MUCH CAN YOUR WIRE ROPE HANDLE? Just because your wire rope says it’s rated for an ultimate load (UL, or breaking strength) of 39,000 lbs doesn’t mean you can use that rope to tow 39,000 lbs. That’s because every wire rope has a working load limit (or WLL), which is the actual mass or force the product can support. It’s the working load limit you shouldn’t exceed, not the ultimate load limit. So why don’t rope manufacturers make our lives easier by giving the WLL on their packaging instead of the UL? That’s because wire rope can handle different weights depending on how it’s being used. Different industries have different WLLs. The working load limit for the towing and recovery industry is ¼ of the ultimate load. For example, standard 1/2” 6 x 19 wire rope has an ultimate load of 26,600 lbs. The working load limit for towing and recovery is 26,600 divided by 4, which is 6,650 lbs. These ratings must be adhered to for the safe operation of the equipment you are using. You’ll notice that most manufacturers are very liberal with their warning labels to minimize their liability. Synthetic rope is becoming a popular tool in the towing and recovery industry for many reasons. It has a significantly higher rating compared to standard wire, it is much lighter and, because it has no memory, there is less risk of damage caused by bird nesting. Over the last few years, synthetic rope has also become more available to our industry. There are a wide range of distributors stocking the common sizes. As with any synthetic product, synthetic rope is more susceptible to damage from sharp edges, but synthetic ropes made with Dyneema fiber is incredibly durable. You definitely get what you pay for, and this rope is more expensive than basic wire. The three most common terminations used when attaching a hook to a wire rope are a Flemish eye with thimble splice, open swage socket, and wedge and socket (Becket). 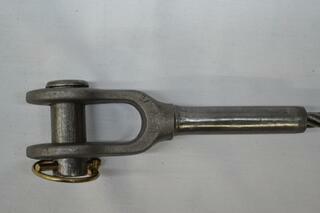 The most common of all the terminations is the Flemish eye with thimble splice. In all cases except the open swage socket (pictured below), the rated capacity of wire rope is reduced when a termination is added to the end of the wire. When a Flemish eye with thimble splice is installed properly, it preserves 90 to 96% of the rope’s rated capacity. The wedge and socket (pictured below) is the least recommended termination and should only be used to repair a wire that has been damaged in the field. The termination efficiency for the wedge and socket is 80% of the wire’s rated capacity. That means if we install a wedge and socket on the standard 1/2” 6 x 19, our working load limit is reduced to 5,320 lbs (WLL of 6,650 lbs x 0.8 = 5,320 lbs). We don’t recommend using wire rope clips to terminate a hook on wire rope. Many times these clips are not installed correctly, which significantly reduces the termination efficiency. When it comes to buying wire rope, there are a few things to consider. Grade of steel. Wire rope is constructed with different grades of steel the same way that chain is manufactured. The most common wire rope grade is extra improved plow steel (EIPS) but you can also select extra extra improved plow steel (EEIPS) that is 10% stronger. Steel core vs fiber core. When wire rope is constructed, the strands and wires are wrapped around a center core made of either independent wire rope core (IWRC) or fiber core (FC). IWRC, which is made of steel, provides additional strength. Fiber core cushions the strands by accepting lubricant more effectively. For the towing industry, we feel that the benefit of increasing our single line rating with steel core wire outweighs the benefits that fiber core offers. Strength of rope. When it comes to wire rope, as with many things in life, you get what you pay for. A 1/2” standard 6 x 19 steel core wire rope has a working load limit of 6,650 lbs. If you go for a ½” Python COMPAC 6 steel core rope, your WLL increases to 7,550 (14% increase). Opt for a ½” Python COMPAC 35 steel core rope and your WLL increases to 9,100 (a 37% increase over then standard wire). The COMPAC 35 rope will cost you three times the price of the standard 6-strand wire, though. Lang lay or regular lay. There are advantages and disadvantages to both lang and regular lay wire rope, depending on the application. Most manufacturers specify the types and lays of wire rope to be used on their piece of equipment. Be sure to consult the operator’s manual for proper application. Quality of manufacturer. 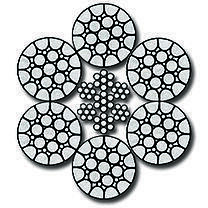 Talk to your wire rope supplier about the rope manufacturer. Imported wire rope is very common in today’s marketplace and many of these suppliers are quality manufacturers. The only way you can tell the quality is by asking questions about the product you’re buying. It’s important to regularly inspect your wire rope for damage. The most common signs of damage are broken strands, kinks, and flat spots from improper wrapping on the winch drum. Constantly inspect your wire during a recovery to ensure that the winch is gathering wire properly on the winch drum and the wire is properly layered on the winch. If you want to prolong the life of your rope, take the time to unwind and rewind your wire at the first sign of overlapping or bird nesting and always stay within the working load limit. Depending on the amount of wear and tear your wire is exposed to, you may need to replace it more often. In order to determine when you need to replace your wire, you must unwind it from the winch drum and inspect each foot of wire to determine if it needs attention. This is also a perfect time to lubricate your wire when you wind it back onto the winch. We recommend replacing your wire rope at the first sign of overloading. It’s important to remember that most wire ropes fail from the inside out. Wire rope lubricant prolongs the life of your wire by protecting it from rust and corrosion while at the same time keeping it flexible. The best lubricant is one that was specifically designed for wire rope. Select a lubricant that doesn’t contain acids or alkalis. We recommend a moly or asphalt-based lubricant. Don’t apply used oils. In order to protect ourselves and others from injury we must have the confidence in the equipment we are using. You can now speak to your rope supplier with confidence. Ask questions about the product you are about to buy. You never know if it is a quality manufactured piece of equipment.